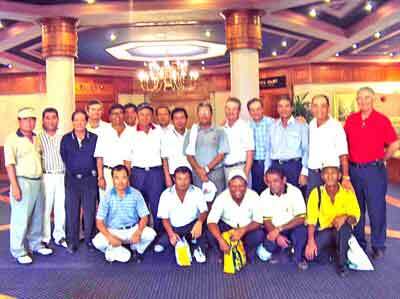 Representatives from the Singapore PGA, Thailand Seniors PGA, Philippines Senior PGA, ROCPGA, Japan PGA, Korean PGA, Australian PGA and Hong Kong PGA met at the inaugural 2003 Asian Senior Masters - Singapore to discuss and confirm the birth and launch of the Asian Seniors Tour - AST. The AST Secretariat to be based in Singapore, has since 2003, staged ASM tournaments in Taiwan, Korea, Thailand, Singapore and Malaysia, with discussions still underway with sponsors and tourism authorities for the 2007 season, where the AST plan to stage new events in Australia, South Africa, Brunei, Indonesian, the Middle East and China. The AST Managing Director Chuan Campbell will manage and coordinated the Asian Seniors Tour growth and development via the AST's appointed events management company, ASM Golf based in Singapore. The budget required in order to stage a US$ 100,000 purse ASM event is only US$ 300,000 and includes TV production and up to 4 hours of guaranteed airtime on the ESPN - StarSports Asia Pacific beams. Please contact Chuan Campbell should your company country and or tourism authority have a desire to stage and or sponsor an ASM event any where in the world!